It's hard to do a review of an album when you truly feel that it's the essence of perfection. Where is one to start? What can be said that will accurately convey the importance and beauty of such an album? What can I write that won't be a total understatement? After all, I've never claimed to be a qualified critic, a brilliant writer or of having an ear for talent... 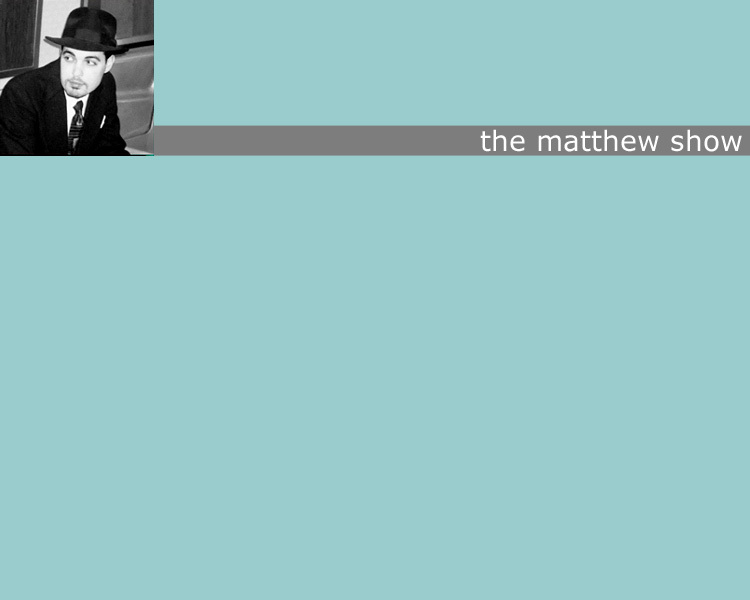 I'm just a guy who likes good music, and in my opinion the matthew show is good music. I've been listening to this album for quite awhile. The first time I listened to it I enjoyed it enough to play it again later in the same day. But it wasn't until I listened to it a half a dozen times that I began to realize how truly wonderful this album is. This is an album that is best listened to in your quiet place, away from everyone, away from the world. It's a perfect "in your room" album to listen to while you are reading, contemplating, or whatever it is you do in the privacy of your own room. The songs on this album aren't just lyrics, chords, or arrangements...they are thoughts, emotions, and feelings that go deeper than mere sound to touch your very being. It's hard for me to imagine a person not being moved by the songs on this album. The violin on Symbiotic Angel is especially alluring, making it my favorite song. Office Suite Parts I & II are a humorous look into the monotony, politics, and bureaucracy surrounding the typical office environment which should generate a chuckle or two from most. All in all I would have to say that this album is worth a listen for anyone who appreciates thoughtful lyrics are true musicianship. I think the picture on the front of the album pretty much sums up the feel of the music inside. The Loneliest Boy in Toyland and Office Suite, Part I are offered as full length samples on the website. Those two songs alone should be enough to persuade/dissuade you to buy the album.